JointFlex Pain Relieving Cream is an over-the-counter topical pain-reliever that is often used for relief of osteoarthritis pain. Osteoarthritis is a common type of degenerative joint disease that causes persistent joint pain and stiffness. A number of topical creams have been shown to provide temporary pain relief and comfort in osteoarthritis, with a low risk of side effects. Currently, topical creams are among the first-line recommendations for treatment of osteoarthritis pain, especially among those who are elderly or who may be otherwise susceptible to developing side effects of the oral (by mouth) medications used to treat osteoarthritis. JointFlex is often recommended for treatment of pain relief in osteoarthritis. However, it does not slow down or cure the disease itself. According to the manufacturer, it can also be used to relieve pain from muscle sprains and strain, simple backaches, bruises, and cramps. Osteoarthritis affects men and women. It is a progressive condition characterized by aching, pain, and stiffness that worsens over time. It typically begins after age 45 and advances with age. Osteoarthritis is a breakdown of the tissues in the joints and it can be exacerbated by joint injuries or by a lack of mobility. There is no cure for osteoarthritis. Staying active and getting moderate exercise is usually recommended. Often, management of pain can help you stay active if you have osteoarthritis. 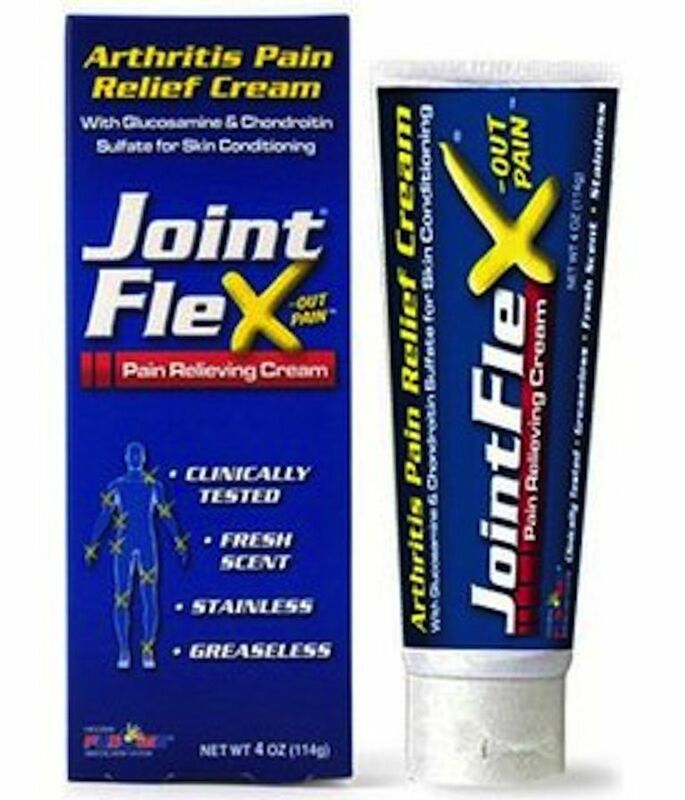 JointFlex is available as a cream, and it comes on a 4-ounce tube. It is available at most major pharmacies and drugstores without a prescription from a doctor, with prices ranging between $12 to $20, depending on the vendor. The makers of JointFlex recommend applying the product twice a day (morning and nighttime). Some users experience a degree of pain relief within 5-20 minutes after the first application. JointFlex Roll-On, as its name suggests, comes with a roll-on applicator. The roll-on had been marketed for the relief of muscle pain, back pain, shoulder pain, and neck pain, and is no longer available. Camphor is the active ingredient in JointFlex Pain Relieving Cream. This substance is believed to reduce pain relief. It is a counterirritant, which means that it reduces the symptomatic pain and discomfort by irritating the surface of the skin —without causing any actual harm. Glucosamine and chondroitin are common ingredients in many dietary joint health supplements. These ingredients are added to topical JointFlex for skin conditioning, which aids in the delivery of active ingredient so that it can work faster. The manufacturer uses a number of other ingredients in JointFlex that they describe as inactive, including lanolin, aloe vera, peppermint oil, and Vitamin E.
Evidence of efficacy (that the product works) is referenced on the manufacturer's website with an Australian research study published in 2003 in The Journal of Rheumatology. Study participants who had knee osteoarthritis used either a topical glucosamine and chondroitin preparation or a placebo for a period of eight weeks. The participants who received the glucosamine and chondroitin preparation experienced improvement in their within four weeks and the difference in effects between the two groups was sustained for the whole eight week study period. JointFlex Pain Relieving Cream is recommended for external use only, and you should not use it in your mouth or get it in your eyes. Generally, this product is not commonly associated with side effects or risks. In rare instances, it may irritate the skin if you use it on an open wound or on an area of the skin that is already irritated. The manufacturer does not recommend use for children aged 12 and under. People who have a known allergy or sensitivity to camphor or any of the ingredients in the product should not use JointFlex. If you have been using JointFlex without satisfactory relief, you should discuss your condition with your doctor. You may have another medical problem besides osteoarthritis, or you may experience more improvement with a different medication. Cohen M, Wolfe R, Mai T, Lewis D. A randomized, double blind, placebo controlled trial of a topical cream containing glucosamine sulfate, chondroitin sulfate, and camphor for osteoarthritis of the knee. J Rheumatol. 2003 Mar;30(3):523-8.